We are actively engaged in offering best and most perfect quality assortments of Non Woven D Cut Bags. These bags are D cut design and available in many colors. They are non woven and very durable to use. 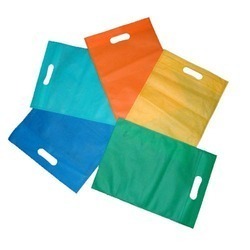 These carrying bags are highly used in shopping malls and promotional purpose. These bags are available in many colors and grades. They are affordable in rates. We, Durobags Pvt. Ltd. are well known enterprises established in the year 2010, at Delhi, (India). We are the biggest and most appreciated name in the market offering best collections of bags like NonWoven Bags, Carry Bags, Paper Bags, Promotional Backpack and Bag Printing Services. These bags are designed by our experts with the use of modern machines and skills. These bags are produced by our engineers with the utilizations of modern machines, skills and cutting edge technology. These offered bags are use for carrying purpose in shopping malls and promotional purpose by companies too. They are available in many sizes, designs to appeal the eyes of customers. Our offered bags are highly appreciated for many factors like quality assurance, stylish finish, and durability, light weighted and very reasonable rates. We offer our product under the trademark Durobags.